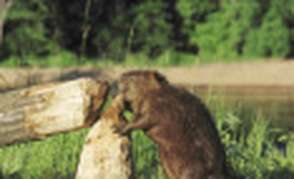 Tualatin beaver removal can prevent beaver damage on your property. If you live near a lake, pond, river, or creek you will most likely have beaver damage at some time. The most common types of problems that we get calls for are when beaver's chew down trees on a Tualatin property which can be very dangerous. If you notice beaver chewing on a tree you can still save it if you have the beaver removed quickly. Another very common problem that beavers cause is flooding when they back up water. This can cause many problems, but the main two are damage to property and losing property by erosion. Beavers will dig into the bank for mud and to build dens, but this weakens the bank and when the water rises it can cause major problems. We are able to trap and remove beaver from your property which can stop and prevent future damage. Depending on the location we have different methods of handling these problems. Beaver Raccoon Skunk Squirrel Coyote Mole, Gopher, or Vole Rodent Bird Bat Dead Animal Removal Attic Clean Out or Sanitation I have NO idea! !